Hundreds of people took to the streets of Madrid on Sunday, March 13 to demonstrate in defense of the Iberian wolf, they demanded an end to the indiscriminate hunting of this species, the rifle should not be the main tool for wolf management but rather implement protection measures, in particular, the animal needs to be declared protected throughout Spain and that management measures should be based on stakeholder dialogue, science that the administrations respect and live alone this jewel of our nature, summed Juan Carlos del Olmo, secretary WWF in Spain. The conservation organization was one of about 200 that were at the origin for demonstration. The organizers claim that the government census of wolves is nothing more than a sum of the regional census, and does not serve to make a plan for conservation of the species. The complaints of the demonstrators are centered on the idea, erroneous reports that it is necessary to hunt them because of the supposed damage inflicted on the livestock herds. The wolf is not the bad guy in the story, said Juan Lopez de Uralde, environmentalist party Equo, but a jewel of our natural heritage that must be protected. The organizers find it intolerable that in the 21st century the Spanish government has not yet been able to take appropriate measures to ensure the coexistence between wolves and livestock. 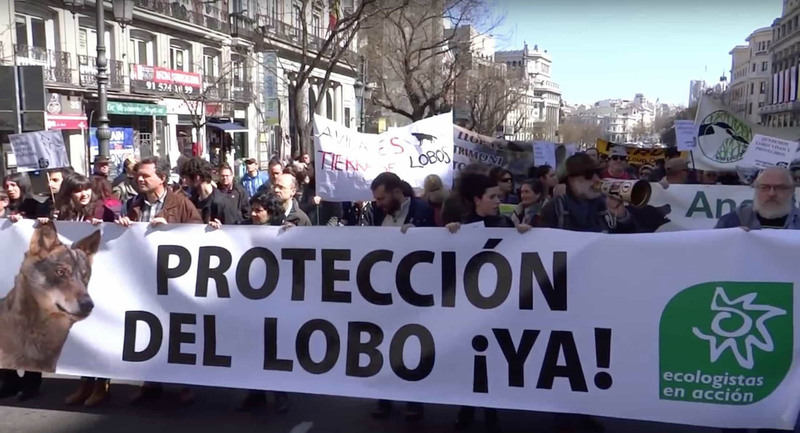 Under the motto Live Wolf, protected wolf, the march moved from the through the center of Madrid, with some of the protesters imitating the howls of the animal and elsewhere, people were serious and silent, displaying pictures of wolves killed in different parts of Spain. There was even a band playing funeral music. WWF reported that the national census of wolves released this week by the Ministry of Agriculture, Food and Environment is not a true national census because it is just a set of partial censuses conducted in the different autonomous regions therefore the data is not used for a conservation plan for the species. Wolf in Italy: Under threat! Does Norway have a new wolf species?